Filling key knowledge gaps for better management of this pulse pest. An adult pea leaf weevil. Photo courtesy of Jonathon Williams, AAFC. With a lot of the insects that we deal with on the Prairies, we have a pretty good idea of their biology and what is affecting their populations, but we have some knowledge gaps that we need to address. Pea leaf weevil is one of those pests where gaps exist,” says Meghan Vankosky, a research scientist in field crop entomology with Agriculture and Agri-Food Canada (AAFC) in Saskatoon. 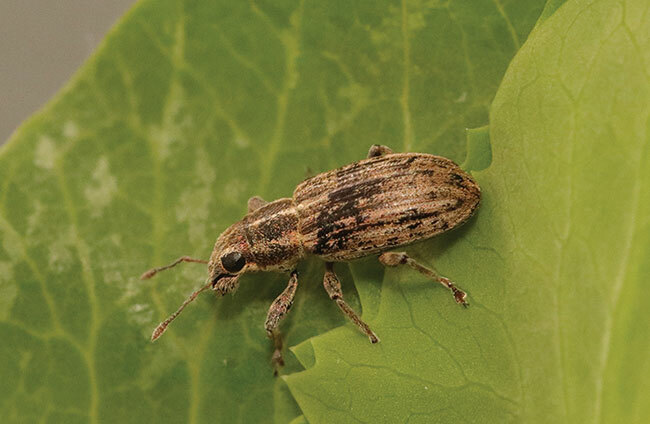 Vankosky has been involved in many pea leaf weevil (Sitona lineatus) studies since the late 2000s, first in Alberta and now in Saskatchewan, that are advancing understanding of this pest under Prairie conditions. Her current research includes a three-year project to answer some key remaining questions mainly from a Saskatchewan perspective, where this pest is a relative newcomer. The weevil can cause serious problems, especially in field pea and fababean crops. Vankosky says, “In a year with high pea leaf weevil populations, the double impact of foliage damage by the adult weevils and root nodule damage by the larvae can lead to economic damage from the reduction of the photosynthetic area and the reduction of nitrogen fixation.” The weevils and their larvae essentially attack the plant from two fronts. Since 2012, pea leaf weevil surveys have been conducted each year in Alberta and Saskatchewan in late May and early June. These surveys show the pest is gradually spreading east and north through the field pea and fababean growing areas of both provinces. In Alberta, the pest has been found in most of the province’s agricultural area, from the U.S. border to the Peace River region. In Saskatchewan, it has been found as far east as the Manitoba border and as far north as Saskatoon. Feeding by the adults creates distinctive U-shaped notches, so the surveys count the number of notches as an estimate of the local population density. The survey maps are posted on the websites of the Alberta and Saskatchewan agriculture departments. Although these aren’t actual forecasts, growers can use the maps, along with their own experience, to help in making decisions on pea leaf weevil management, such as whether to apply an insecticidal seed treatment in the following spring. Her three-year project, which started in April 2017, includes an insecticide study and an overwintering biology study. Saskatchewan’s Agriculture Development Fund and the Saskatchewan Pulse Growers are funding the project. Vankosky is also collaborating with the Alberta Pulse Growers on field-scale work under this project. Researchers such as Vankosky and her AAFC-Lethbridge colleague Hector Carcamo have already done much of the groundwork about the pest’s life cycle in Alberta and Saskatchewan. The insect has one generation per year on the Prairies. The adults overwinter in perennial legume fields or leaf litter. Depending on the weather, they usually emerge around early to mid-May. They start feeding on the leaves and growing points of any nearby legume plants, but the weevils soon walk or fly to pea and fababean crops, which are their primary hosts. Once the adults find a primary host, they mate and the females start laying eggs about a week later. After hatching, the larvae go to the root nodules and feed on the nitrogen-fixing Rhizobium bacteria. Only pea and fababean nodules support the weevil’s larval development. The insects pupate in the soil, and the new adults emerge in late July and August. They feed on the green leaves of legume plants, and then seek shelter for the winter. Vankosky’s overwintering study aims to get a better understanding of the factors that influence overwintering mortality in Saskatchewan and to use that new knowledge in forecasting the pest’s population. The study involves three components. In one component, she and her research team are trapping the adults in the spring to figure out where they are overwintering, when they are emerging and to get an idea of the weevil populations early in the season. Another component involves lab experiments to see how well the adults withstand exposure to different cold temperatures for different lengths of time. And in the third component, they are placing weevils in the field over the winter in containers with very little insulation to assess survival under field conditions. Vankosky is in the process of analyzing the results from the first two years of the overwintering study, and expects to be able to share some information on this in the next few months. Vankosky’s research includes a field experiment at Swift Current to assess the effectiveness of a seed treatment product and a foliar product for pea leaf weevil control. Photo courtesy of Lee Poppy, AAFC. “Research work on different insecticide products has been done in Alberta, but none of that work has been done in Saskatchewan until now,” Vankosky notes. In fact, part of her master’s research with Carcamo in Alberta in the late 2000s was a study about the effectiveness of thiamethoxam (Cruiser), a systemic insecticidal seed treatment, for the control of the pea leaf weevil. Her current insecticide study has two parts. One part is small-plot research at Swift Current comparing two products registered for pea leaf weevil in Saskatchewan: thiamethoxam seed treatment (Cruiser); and lambda-cyhalothrin (Matador), a foliar product. The treatments are: the seed coating at the label rate; the foliar at the label rate and timing; the seed coating plus the foliar; the seed coating plus a half rate of the foliar; and a control treatment with no insecticide. The objective is to evaluate the effects of the treatments in field pea on: the pest’s damage to the foliage; the pest’s damage to the root nodules; and yields. The study’s other part provides a field-scale look at the effectiveness of the thiamethoxam seed treatment. Vankosky had challenges in getting plot space large enough to do replicated field-scale research in Saskatchewan, especially with the lower pea leaf weevil levels in the last two years. 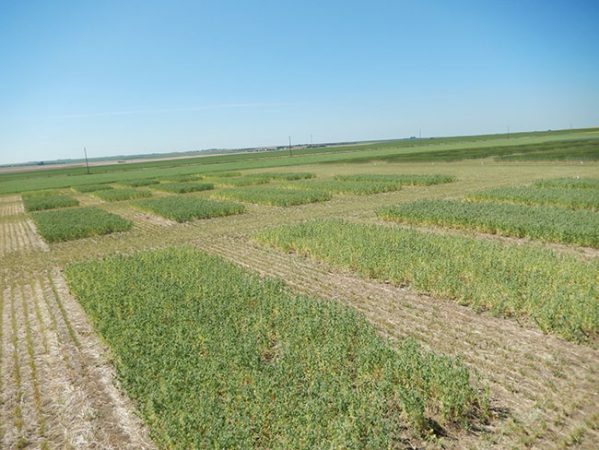 Fortunately, the Alberta Pulse Growers (APG) has developed a Plot2Field program, which involves bringing together growers and agronomists to test small-plot results in field-scale plots. APG was already using the seed treatment in this program, so basically all that was needed was to add control plots with no seed treatment. So Vankosky’s field-scale work took place at multiple sites across Alberta in 2018, and she hopes to continue this in 2019. The Swift Current area had very low populations of the weevil in 2018, so the small-plot findings so far are mainly for 2017. “The results for the small-plot trials at Swift Current in 2017 show that the systemic insecticide works as expected in terms of reducing foliar and nodule damage compared to the control plots or compared to plots that just received the foliar insecticide,” Vankosky says. “There was no benefit to the foliar insecticide. Scott Meers, my colleague at Alberta Agriculture and Forestry, refers to this as ‘revenge spraying’ – it might make you feel better because you think you are killing some weevils, but there is no real benefit to it in terms of reducing foliar or root nodule damage, or improving your yield.” Plus, insecticide spraying could harm the natural enemies that attack the weevil and other crop pests. These preliminary Saskatchewan results are consistent with Alberta research showing that the foliar products provide no real benefit for pea leaf weevil management, and that the seed treatment reduces damage and may provide some yield benefits, depending on the size of the weevil population. In addition to her three-year project, Vankosky is involved in various other pea leaf weevil studies, often in collaboration with other Prairie entomologists. Such studies continue to be very important because, although researchers have been making progress on ways to manage this pest, more needs to be learned to achieve really strong, cost-effective control. For instance, greenhouse studies by Carcamo showed that thiamethoxam only kills about 30 per cent of the adult weevils and only about half of the larvae. Research in the United States found that no-till systems help reduce weevil problems compared to conventional tillage. But many Saskatchewan and Alberta growers already use no-till and the weevil still causes problems. Crop rotation with non-host crops also helps, but adult weevils are able to fly for several kilometres so they can reach other fields. Delayed seeding can reduce weevil damage, but later-seeded pea crops in general tend to have lower yields than earlier-seeded crops. Some preliminary research by Carcamo and Ken Coles with Farming Smarter indicates that trap cropping might be an option.